Luxury In Hair and Beauty. Antoinette Champagne Salon Armadale ANTOINETTE CHAMPAGNE SALON is a premium 6-star luxury hairdressing destination, committed to a culture of creativity, technical excellence and unrivalled personal service. Our guests enjoy a complete experience with the best of hair services in a truly sumptuous environment. 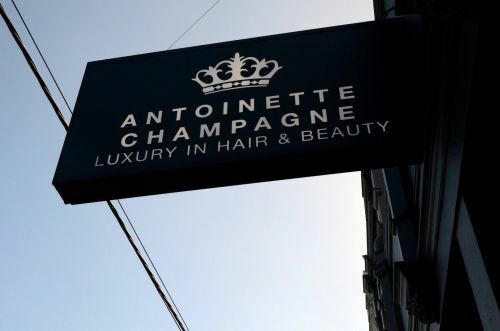 European design and the luxuries in life is the trademark for Antoinette Champagne Salon's Luxury Brand. ANTOINETTE CHAMPAGNE SALON'S POINT OF DIFFERENCE Antoinette Champagne staff will not only be highly skilled technically, they will also go through a unique personal development and communication program which aims to create an incredibly focused, refined, professional and sincere salon team. This high level of professional etiquette and finishing will be the cornerstone of the salon's point of difference, ensuring each clients needs are met with impeccable professional service, style and grace.